Electrothermal offer 3 different models of 1-Way Heating Controllers which operate up to 800W (MC5), 1800W (MC242) or 2300W (MC227); MC228X1 is the 115V version of MC227 and operates up to a maximum of 1100W. 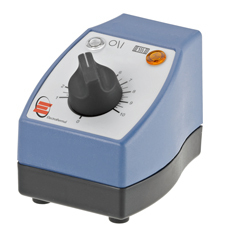 These heating controllers can control one piece of laboratory equipment at a time, or an equivalent load, i.e. for a CMUV22/L which has 3 elements, an MC5 would be needed on each element. The MC5, MC242, MC227 and MC228X1 Heating Controllers have been designed to control the heating of resistive loads for bench top operation. The heating controllers deliver different levels of power according to your requirements and are suitable for EM series Electromantles, the Electric Bunsen and Heating Tapes. Each heating controller has 2 neon indicators: "Power On" white neon light and "Mantle/Bunsen Heater On" amber neon light. They all have a regulator control knob which can be turned clockwise to increase power. 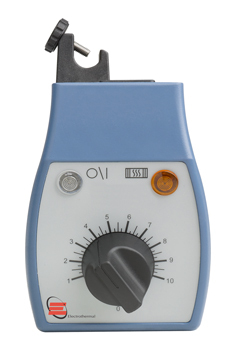 As the knob is turned, the heating controller's amber neon light will pulsate to show that power is being supplied to the equipment being controlled, e.g. mantles, heating tape. 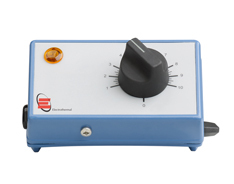 The pulse frequency will decrease as the regulator control knob setting is increased, and at maximum setting, the amber neon will be continually illuminated. A support rod clamp is provided at the rear of each heating controller to take a standard 12.5mm (1/2") diameter rod. They have a short mains lead with an IEC socket to connect them to the resistive load. An accessory extension mains lead is available where remote operation is required, e.g. in a fume extraction unit. The heating controllers can be mounted on standard 1/2" (12mm) diameter scaffold or retort stands, they can also be wall mounted using a mounting bracket or stand directly on the bench.